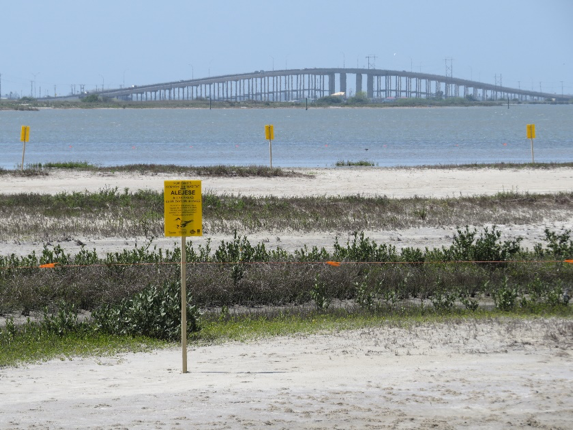 The Texas Shorebird Habitat and Stewardship Program is a collaborative effort led by American Bird Conservancy with our collaborative partners, Gulf Coast Bird Observatory, Houston Audubon Society, and Coastal Bend Bays and Estuaries Program. The purpose of this program is to promote conservation of mainland coastal birds through maintaining, or ideally, increasing nesting success, fledge output, and long-term survival, as well as to protect habitat year-round to ensure successful reproduction, migration and over-wintering for our focal species. During the breeding season we focus our on-the-ground conservation efforts on Snowy and Wilson’s Plovers, Least Terns (seabird), and Black Skimmers (seabird). During the nonbreeding season, we focus our efforts on Piping Plovers, Red Knots, Snowy Plovers, and Black Skimmers. We have a three-pronged approach which includes 1) protect habitat, 2) monitor focal species, and 3) stewardship and education with land managers and the general public. Conservation efforts are primarily focused on minimizing human disturbance in sensitive bird areas and protecting the habitats the birds are using with semi-permanent or seasonal fencing and signs. We work closely with land and natural resource managers like the Galveston Park Board of Trustees, the City of Port Aransas, Texas Parks and Wildlife Department, and the US Fish and Wildlife Service (USFWS) to protect these habitats and to educate the visiting public about how to become stewards for the land and the birds. Monitoring the birds’ response to such management activities is a key component of the program. This program has been in place with varying degrees of effort since 2012. Primary funding sources include National Fish and Wildlife Foundation via various funding opportunities including the Gulf Environmental Benefit Fund, USFWS’ Coastal Program, the Texas General Land Office’s Coastal Management Program, and various private foundations and donors. Changing the culture of land and resource management, as well as public perception is fundamental in protecting habitats and conserving declining coastal bird populations. In Texas, the Open Beaches Act ensures the public has free unrestricted access to beach resources for recreation and use. This creates a challenge in protecting habitat because recreationists drive on the beaches and often drive over dunes and in sensitive back beach or bayside habitats. Dunes and sand/mud flats are considered Critical Natural Resource Areas (CNRAs) by the Texas General Land Office and, therefore, are protected habitats. Limited law enforcement resources and lack of public knowledge about these sensitive areas can make it challenging to enforce protection of CNRAs. This is why engaging land managers and the general public is key to the success of implementing protections and other management actions on the ground. We monitor the birds to identify important areas they use, determine if they are hatching nests and raising young successfully, and to log their numbers and distribution at the sites we survey. Our breeding bird monitoring protocol is based in-part on the Florida Fish and Wildlife Conservation Commission’s Breeding Bird Protocol for Florida’s Shorebirds and Seabirds with adjustments and additions made for Texas coastal breeding birds and specific deliverables tied to program funding sources. We conduct breeding bird surveys two to three times per week per site – all surveys are conducted by experienced and/or trained staff and seasonal contractors or employees. 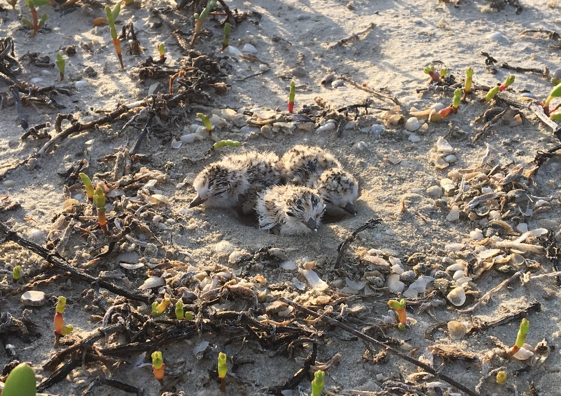 Our protocol is aimed at collecting the following metrics: number of individuals, number of breeding pairs, nest fates for plover species, number of chicks per age class (downy, feathered, flight capable), and number of fledges. We do this each year on a per site basis, but combine results coast-wide to obtain a larger scale picture of how the birds are faring reproductively state-wide. The metric, number of fledges, doesn’t always pertain to each site we monitor. For larger sites with expansive geography, it is not logistically feasible for seasonal technicians to follow broods and ascertain if chicks are fledging. Birds often move out of the area or to other areas within the site that are not accessible on foot. For this reason, we acknowledge that fledge estimates are low; however, we do present a subset of the overall population which is still indicative of the overall success or failure associated with fledging birds. Our team is currently seeking funds to assist with estimating adult survival of plover species based on band re-sight data collected since 2013. These estimates will certainly lend insight into how well the species are doing overall along the Texas coast. For our nonbreeding monitoring protocol, we are using a methodology that examines human and bird use per 1 km transects at our focal sites (Burger and Niles 2014, Newstead and Vale 2014, Neuman et al 2008). Surveys are conducted once a week per site, varying between a weekday (i.e. Monday-Friday) and weekend (i.e. Saturday-Sunday) survey to capture different levels of recreational use (e.g., people, vehicles, dogs) and density and distribution of birds along the beach. For beach-associated habitats (i.e. sand/mud flats behind the beach, bayside), we conduct whole area surveys since the habitat is not linear like a beach. At these sites, we compile total counts of the number of people, vehicles, and dogs (leashed/unleashed) at the site, as well as the number and distribution of focal bird species. 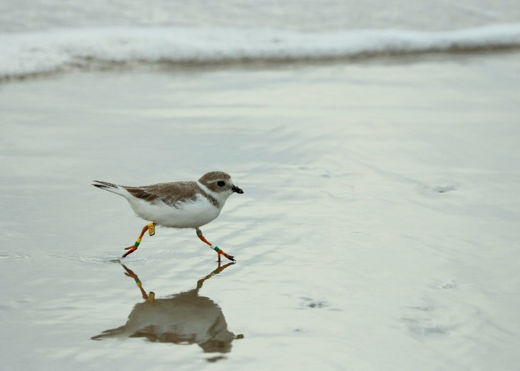 All banded birds are recorded, with an emphasis on Piping Plover and Red Knots. Re-sights are reported to the USGS banding lab. This protocol allows to identify important roosting and foraging areas for migrating and nonbreeding birds. We work with site land managers to protect these important areas through seasonal postings and/or signs. For data storage, we are currently using a cloud-based storage system administered by the American Bird Conservancy. All team collaborators have access to this system and all associated data files. The team collectively owns the dataset and it is accessible to our team and those who request it. We would like to move towards a more transparent and accessible tool, like the Florida Shorebird Database; however, we do not currently have the resources in place to begin such an endeavor. Our efforts to date are based on funding we obtain on a year by year basis. We are actively seeking a longer term funding source to secure the future and ongoing consistency of this program so that coastal birds in Texas can continue to thrive in the limited coastal areas they use. Burger, J., and L. Niles. 2014. Effects on five species of shorebirds of experimental closure of a beach in New Jersey: implications for severe storms and sea-level rise. Journal of Toxicology and Environmental Health, Part A 77:1102-1113. Florida Fish and Wildlife Conservation Commission. Rev 2019. Breeding Bird Protocol for Florida’s Shorebirds and Seabirds. https://public.myfwc.com/crossdoi/shorebirds/PDF-files/BreedingBirdProtocolForFloridasSeabirdsAndShorebirds.pdf. Accessed 5 Mar 2019. Neuman, K. K., L. A. Henkel, and G. W. Page. 2008. Shorebird use of sandy beaches in Central California. Waterbirds 31:115-121. Newstead, D., and K. Vale. 2014. Protecting important shorebird habitat using Piping Plovers as an indicator species. Final report to U.S. Fish and Wildlife Service Agreement No. 1448-20181-A-J839, Corpus Christi, Texas.